Not so long ago, laptops and tablets provided the first opportunity to take your world along with you. Not so long ago, laptops and tablets provided the first opportunity to take your world along with you. When Wi-Fi was added to these devices, as well as to our home offices, and FBOs, it got even easier to stay connected, informed and work from just about anywhere. Thinking back, it was just 10 years ago that doing some e-mail and flight planning from a chair in an FBO was considered leading edge. Then such features became more prevalent on the cellphone, BlackBerry and smartphones, and, increasingly, laptops started getting left at home or in the car. Why carry all that weight when the basics are covered off using a device from your pocket? The only challenge was screen size and quality, and for some, the key board was impossible to use. There are a couple of “given” things in technology and aviation. First – the best thing today will change tomorrow. Second – we are all suckers when it comes to having the next best “thing.” And we can always find a rationale for having it. That said, every once in a while a device or tool comes along that is truly universal and really does move the bar up a notch or two. For today and the near future, that thing seems to be the Apple iPad. Since being introduced last spring and building on the success of the firm’s iPhone phenomenon, the iPad has quickly become the must-have item for many. It eliminates a lot of the frustrations of previous devices, combines many possibilities into a neat and very easy-to-use platform and provides the opportunity to do a multitude of different, unrelated things with the same device. Very cool! At $550 to $880 (depending on the model, memory and inclusion of 3G wireless capability or not), the iPad is not cheap in comparison to many current netbooks or all-inclusive smartphones – but then again, it is an iPad and it does so much more. The number of applications, or apps, seems to be endless and each day brings another. From business tools to entertainment and games, the iPad has something for everyone. And in typical Apple fashion, getting up and started is simple and the device is user-friendly. This is one device that has simplicity and user functionality built into every possible angle. No constant stream of updates and “patches” to the basic unit compared to other operating systems. Even the individual apps update seamlessly and without much fuss or user interface. Add all of this together and you have a tool that truly does the job it was intended to do. Battery life is great too (days as opposed to hours, depending on what you are doing or how you use it). And the added options such as keyboards, protective cases and desk or countertop stands are well thought out and very functional. IPad breaks the barrier into aviation . . . The iPad has become more than just a pilot tool or a maintenance asset. It has managed to bridge the gap in numerous ways and in the process has become many things to many individuals based on their specific needs or wants. One of the best places for a quick search of just what is available to the aviation world is a website called www.aviatorapps.com. At press time, the site had an impressive 400 apps focused on aviation for the iPad. Each app listing has a quick link to the host site and from there a potential user can view just what it does and decide if it is worth purchasing. Typical of most iPhone and iPad apps, the prices are very reasonable and the majority of them cross over between iPhone and iPad – allowing better and more complete use. Another place to check out is www.MyGoFlight.com. As the site points out, while many apps have been created just for the iPad (with more created every day), some are being repurposed from their origins on the iPhone, some from personal computer software and some from print form. To help understand what is what, MyGoFlight has developed a framework for understanding each iPad and Internet app and what it does. For ease of use, the apps are broken down into categories – pre-flight, in-flight, and post-flight. MyGoFlight charges subscriber fees for use of its service. Looking at some specific apps . . .
With more than 400 apps, it is difficult to give a complete overview of the market. That said, here are some snippets of a few that stand out today. One of the leaders in the iPad app world from the flight ops arena is a product called ForeFlight. According to the developers, users can see approach plates, routes, fuel prices, VFR/IFR charts, radar, flight rules and airport maps in greater depth and detail than ever before. Termed “the latest evolution” of the Pre-flight Intelligence product, ForeFlight has been specifically optimized for the iPhone and iPad platform. The app provides access to high-quality weather information, airport intelligence, service providers, flight planning, and much more. ForeFlight is purported to be very customer-focused, offering real-time support, quick fixes, frequent updates, and personable service. Unlike many of the first-generation apps that fail to extend themselves beyond the 49th parallel, ForeFlight has incorporated Canadian data into its ForeFlight Mobile 3 HD product. This provides information and flight support for student, private, commercial, business aviation and military pilots. The feed is directly from Environment Canada, and the clear, bright, zoomable graphics provide indicators for lightning, hail, mesocyclones, echo top height and storm motion vectors. And, of course, because of iPad Wi-Fi, the data can be constantly updated via aircraft broadband systems while in flight. According to Jason Miller, co-founder of ForeFlight LLC and Preflight Intelligence for Pilots, they are actively working to provide nav charts for Canada, as well as more data, but a timeline is not available yet. And the cost? A three-month plan with everything included is $24 or you can go for a one-year option at $74.99. Check out the app at www.foreflight.com . 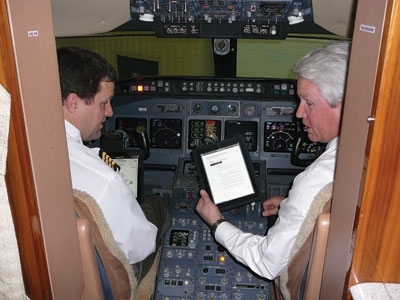 At the 2010 National Business Aviation Association convention, AvConnect, (an AvFusion, Inc. company), revealed its new iPad application. AvConnect provides an online solution – connecting pilots and owner/operators to their service centres, maintenance managers, fellow pilots, OEMs and FBOs through advanced online and mobile applications. From flight tracks to logbooks and currencies, to complete maintenance tracking and tax preparation, AvConnect delivers a pilot and aircraft management system. Pilots have every benefit of AvConnect, plus flight planning, moving maps and approach plates from WingX Pro7, service centre communication and document exchange through EBis software, online FBO planning from www.ALLFBO.com, and instant air-to-ground communications with Internet services through networks such as Aircell. Never one to be left behind when it comes to leading technology, Jeppesen announced during the 2010 AirVenture show that its Mobile TC (Terminal Charts) app is available as a free download at iTunes. Chart subscription services are available through Jeppesen and each paid subscription includes four “seat licences.” Typically, pilots will dedicate one seat licence for their panel-mounted MFD, one for use on their home computer, and one for a laptop, leaving one which can be used for the iPad. Jeppesen is well known for working well with others and this past fall, in conjunction with Avidyne, the two announced that owners of Avidyne displays with CMax Charts can now download terminal charts, airport diagrams and/or European VFR charts subscription from Jeppesen for the iPad at no additional charge. As we have come to see with many iPad apps – this is only a first step. Look for more to come soon. OEMs are jumping on the iPad bandwagon, too. Apart from working with the avionics world to bring the technology to the cockpit and cabin (as a passenger entertainment amenity), Cessna has a product called iFlite, which is currently focused exclusively on its single-engine fleet. The iFlite mobile data system is populated with critical flight information and planning features. With it, pilots can instantly access up-to-the-minute weather images, plan routes and check landing status. Checklists and Federal Aviation Regulations (FARs) also are available along with pilot training videos. With the iFlite app, pilots will have access to performance calculations and Pilot Operating Handbook (POH) subscriptions and will be able to file flight plans and access Cessna checklists from the devices. Once again, the cost is something to note – only $149 with an annual $99 subscription fee. For an additional $39 you can add the POH with a valid copy of the paper POH manual. What about real operators here at home? Bottom line: if you are studying aviation maintenance, checking the weather, flight planning, or just wanting to sharpen up on some reading, there is an app for that. As for accessories, from knee pads to cabin brackets, someone somewhere has thought of the iPad and created the right tool. And while some of the apps are not fully Canadian in their support yet, they will be soon. And if you travel internationally, this tool will work for you now. Going forward we can expect to see iPads in virtually every aspect of aviation operations and support. It is one very cool piece of technology that even the average person – techy or not – will find useful and easy to operate and understand. The only thing that could not be found was an app to teach you how to use all of the iPad’s features. Perhaps that is coming soon.